This series started when I was asked to teach a papier maché class for pre-school teachers in 2016. 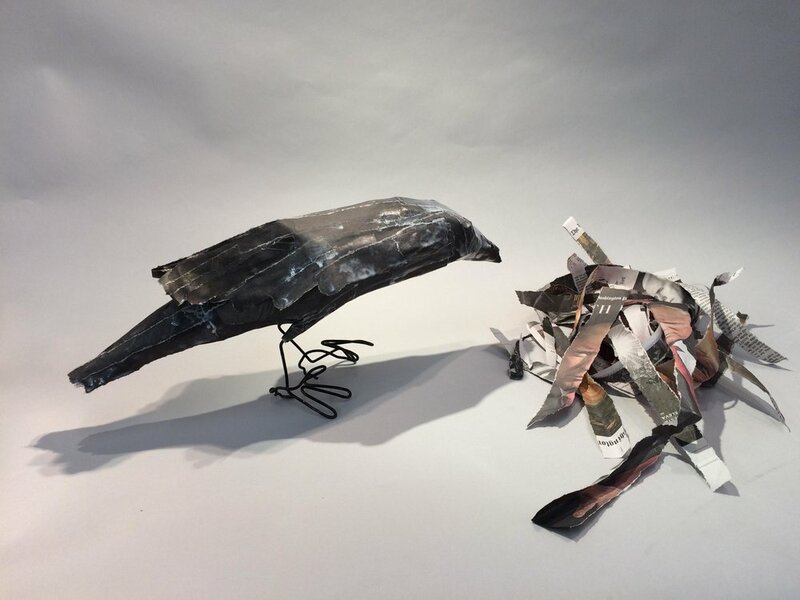 Made from basic materials like toilet paper rolls and postcards, some of the birds are stand-alone decorative sculptures, others are incorporated into more complex narrative pieces. The galleries linked to this page show the birds I have made since the beginning of this project. The Birds for Sale page includes birds that are presently in my inventory for sale. I am always happy to discuss commissions, if any of the birds in the archives speak to you, or if you have special paper or other suitable material that you would like me to incorporate into a bird. I love to make these birds, because they are fun and pretty, and the sky's the limit. I find papers in obvious places (used wrapping papers, old books and magazines, and catalogues) but sometimes less obvious ones (empty sugar packets, chopstick covers, candy wrappers). I have found that the bird bodies provide enough character and temperament (tilt of the head, position of the legs) to make the pieces come to life, and then the outer covering just adds to the final effect. The birds in this category are more timely and political or are a commentary on issues of the day. They sometimes use less common materials. They are a bit harder to compose, in part because the material is more scarce (flyers from marches are only available right before and during the march), but also because the message is as important as the appearance. More often than with other categories, these birds are combined with other objects and materials to frame a setting or narrative. Sometimes I make birds that incorporate intriguing materials, simply for the sake of tweaking the imagination of what is possible. 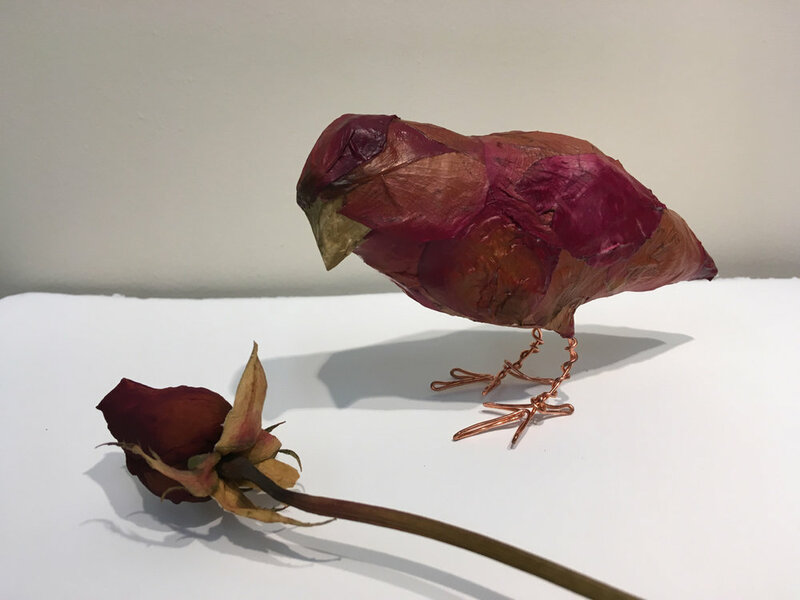 I have been using rehydrated rose petals, discovering the many types of roses change shape and color as they are rehydrated and then dried again on the armature. Hornet nest "paper" is very fragile and difficult to manipulate, but the end effect is well worth the extra effort. These are more of a crap shoot in the making. An adventure.